You are here: Home › Blog › New Zealand Property market on the way up! When you mention New Zealand’s property market, the majority of people think of Auckland immediately and their booming market. If you are an Aucklander it is consuming, this is all 90% of people are talking about daily in the coffee houses, around the water dispenser at work and in the many drinking establishments after hours. But it is not only just Auckland now with increasing capital gains, the ripple effect is working and the rest of New Zealand has woken from the slumbers and is now experiencing good steady gains in value. 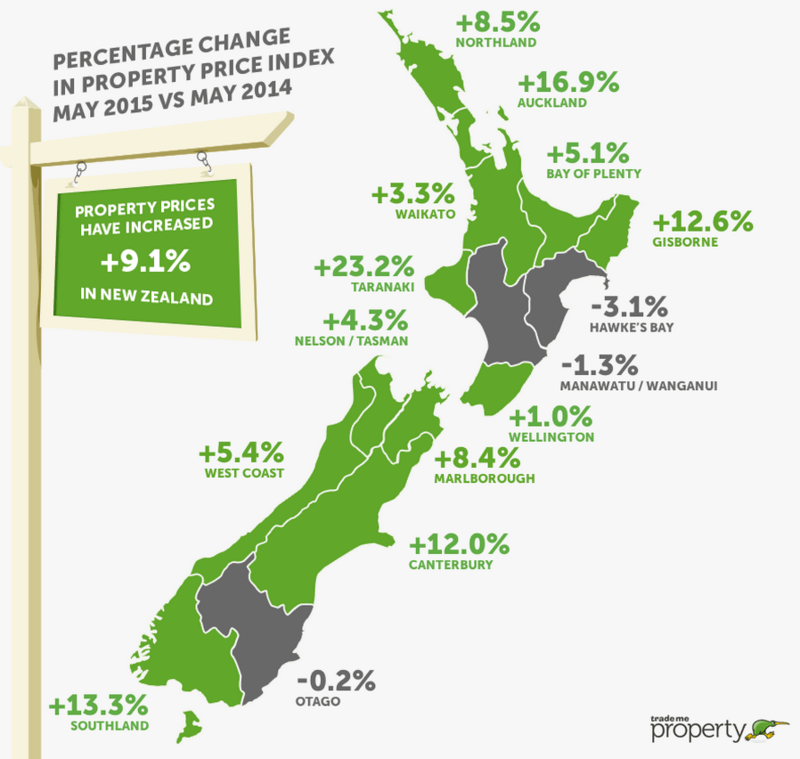 What I wrote is playing out and a lot of provincial NZ are experiencing healthy capital gains in property prices. The reason you aren’t hearing about it is Auckland is still taking the limelight. As you can see in the diagram above there are some massive gains, with five of the regions being double-digit and very close to rivalling Auckland’s increase. (Taranaki out does Auckland). What you will see over the coming year/s is Auckland’s growth slow (Yes ladies and Gentlemen, it won’t carry on at this rate forever!) but the rest of the provinces will continue to have increases in capital growth. Really smart investors would have spotted something in the above diagram. There are three regions with negative growth, these are Hawkes Bay, Manawatu/Wanganui and Otago. The reason I say really smart is that these are the regions the smart investors will target to maximise their gains. These three regions haven’t started their capital growth climb yet, they are last out of the blocks in a race to the finish line. Auckland is nearly at the finish line, whereas these 3 regions have just started the race! Its reverse psychology, and this is why it is only a small percentage of property investors who become wealthy, as these are the smart savvy investors who use this tactic and they will do ten times better in succeeding to build wealth than your average Mum & Dad investor.